Peter Gleeson's 'Yacht Plan for Spit Overhaul' article in the Weekend Bulletin January 27-28 2007 probably helped sell a few more papers. Well at least one copy. So he is doing his job! Our job however is to keep reminding the public that has so passionately supported us over 2 years of campaigning that there are still those with predatory visions for our public open space at the Spit. 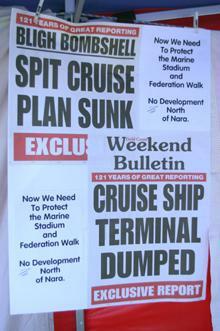 "Same party different wrapping paper" - its simply a push to add a private marina in Marine Stadium. On Saturday a friend asked me to drop him at Marine Stadium where he would participate in an open ocean canoe race that finished at Currumbin. Not much of an ask is it? Well he may have had visions of a simple drive down the coast - I had visions of Australia Day weekend gridlock that would not normally coax me out of my cocoon - not in the middle of the day anyway. Get up early have a surf and only venture out on a push bike once the traffic chaos starts is my usual modus operandi. I don't blame anyone for coming here - and its no wonder the tow truck drivers congregate waiting for the spoils at the Sundale bridge. This is the first glimpse of water on the drive from Brisbane and can mesmorise a motorist and help cause collisions. Back to the story - I said to my friend in the canoe race that did he know that at least one development mob and his asscociates are trying to take over this launching area for a private marina. "They couldn't do that - where would the public go?" was his response. "The public would not accept that" he continued. It goes like this - a developer wants to get a chunk of public open space - that's their job - developing. They lobby everyone they see as helping their cause and look for an angle to sneak it past the public. 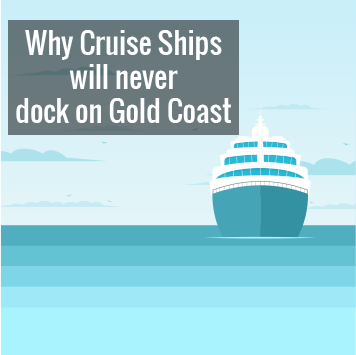 The cruise terminal was going to be such an economic boom that the private marina and other land developments that snuck in on the back of it would escape community attention. Well we know that didn't work, but whilst the majority of the public think that we saved the Spit it was really just a stay of execution, and along come those same developers ready for another go. I still remember the kid on his bike yelling our to me as I was handing out information prior to the election. "It's saved - haven't you heard"
I also remember when first handing out the info thinking that I would cop a bit of flack from the odd motorist queued up at the lights. Well I was wrong and so was the kid. The response from the public was totally supportive. was may favourite bulletin headline and we enjoyed our 5 minutes of celebration. Stickers on cars up and down the Coast and daily on the M1 to Brisbane indicate we are now a community ready to stick up for its precious coastline. Sure. Just don't place it on our public open space. "No development north of Seaworld"
At one stage the Boating Industry Association were fine with this - apparently not anymore. Anyone including Peter Beattie and Anna Bligh must know that the public will feel very betrayed if a plan emerges that threatens their public open space. "Developers would pay the government for a 99 year lease to build an international hotel or units in its place. Also included in the plan is a community ferry terminal, dredging and a commercial retail centre." This is a very inflammatory article and demonstrates the influence a minority of greedy developers can have. We should never underestimate their ambitions. Now with a small taste of victory over the ridiculous Cruise Terminal, getting public support to hand over Marine Stadium to a developer for a private marina will receive its due fate. This will be assured by the continued strong public support for Save Our Spit Alliance. Get ready for round 2 and the fight of your life!